Free Estimates over the phone ……. Safegard Exterminator offers a one-time residential pest control treatment for tiny ants, carpenter ants, spiders, centipedes, earwigs, silverfish, roaches, fleas, pantry pests, and rodents. Included in your initial residential pest control treatment is a follow-up service available at your request for a reduced rate within a four month period. And as always, there will never be a contract to sign. 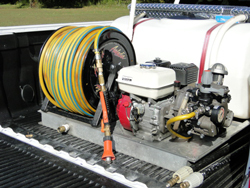 A truck mounted power spray unit for any kind of home that has a cedar roof or siding, wooded areas, or places outside the home that are not easily reached with a handheld sprayer. The power spray units can reach up to 40 feet in the air at well over 100 PSI for those stubborn wasp nests high in the eaves of any structure. 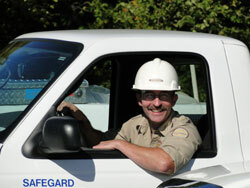 Safegard is one of the first to offer an exterior rodent control station service for areas of high mouse activity. 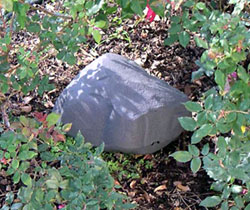 Our decorative hollow boulder-looking feeding stations will drastically reduce the population of small rodents in and around your home. A monthly or periodic service will be provided to inspect and refill stations for maximum effectiveness. You will speak with a live person who is well-trained, knowledgeable about pests and able to assist you in achieving a solution for you and your pest control needs.